Siguatepeque, Honduras: Wood Products International, Inc., a leader in the renewable forestry industry, recently honored the Honduran National School of Science and Wood, Esnacifor (Escuela Nacional de Ciencias Forestales), with a scholarship in Wood Engineering and a donation in the amount of 300,000 Lempiras. The endowment included the Gil Aguilar Bradley Plantation, a tree farm of 75,000 pinewood trees. A statement of cooperation between Esnacifor and WPI was also signed. Richard E. Davis, representing WPI, traveled from Savannah, Georgia to the city of Siguatepeque to present the funds to the prestigious institution on July 8, 2010. Davis said the funds be used for the planting of 75,000 pinues oocarpa (pine ocote) trees, a renewable wood that is utilized in many Honduran homes. He continued, stating that the purpose of the initiative is twofold: to ensure a sustainable forest at Esnacifor while allowing WPI the opportunity to take an active hand in the conservation and preservation of Honduras’ abundant natural resources; and to collaborate with educational and scientific programs Esnacifor offers to students in all of the Americas. 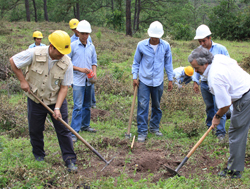 He also hopes these plantations will become sources of drinking water for the Honduran people. In addition to the 300,000 Lempiras for the cultivation of the 75,000 pine ocote trees, a special donation was made to endow a scholarship so that an Esnacifor graduate may attend a foreign university. The planting was held in the school’s forest, at the plantation named for two pioneers of Wood Products Int., James M. Davis and Gil Aguilar Bradley, both deceased. Bradley purchased the land for Esnacifor 40 years ago, while establishing a sister company in La Lima, Cortes, Honduras and one in the United States. In the fields where the planting took place, Richard E. Davis was accompanied by WPI’s manager of Honduran operations, Jose Gil Aguilar. Both visit Esnacifor frequently, where they purchase pinecones, pine seeds and other renewable wood products for the American markets. Davis’ future projects include the Lancetilla Botanical Garden in Honduras, the second largest tropical botanical garden in the world. Esnacifor was founded in 1969 with 142 students and currently has an enrollment of over 1500. Wood Products International began operating in 1986 and has been relying on the wood products of Esnacifor since 1969. Want to learn more about the 3 Tree Pledge Program?